This Nissan 350Z Is A Real Life TRON Car! - Muscle Cars Zone! 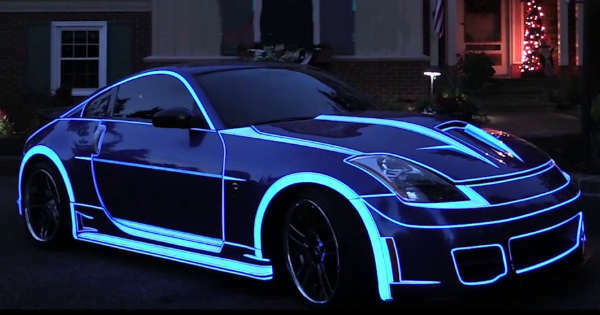 This Nissan 350Z Is A Real Life TRON Car! There are many awesome modifications that people have done to their vehicles, but as the technology progresses, the possibilities of making your car look better are growing more and more. So, what is the thing that can make your car unique, even though we have seen absolutely everything so far? Well, if you love how a TRON car looks and want to try out something new for your car, check out this amazing Nissan 350Z and you might just get the inspiration you had always needed. Namely, this mighty and beautiful car was painted with LumiLor. We see the car in action in this short video during night. One thing is for sure, you would fall in love with the Nissan 350Z the same moment you are going to see it rolling down. From the distance we see a blue color that seems to appear and disappear at certain points, but when it stops near us, we see its true beauty. It looks just like the TRON car and it is unlike any other car we have seen so far. The visible outlines of the car have been painted with LumiLor to make it glow like this. This awesome modifications was done by H2O Graphics by Design Inc. and according to us, this is currently one of the best modifications you can do to your car. What do you think; would you ever consider doing this to your car to make it look like this gorgeous Nissan 350Z TRON Car?